As a flooring installer, you take great pride in every installation you perform. INSTALL and the Carpenters Union deliver training, certification, employment and many more benefits. How do you take your work to the next level? How do you sharpen your skills and increase your own marketability in an increasingly competitive market? INSTALL has just the thing. By completing our comprehensive training program, you will be uniquely qualified to handle even the toughest installations. The INSTALL promise is to provide the best training and opportunities in the flooring industry. Installers who complete our apprenticeship and training program are the best of the best. Because INSTALL has the support of the entire industry, our training program will prepare you for any flooring installation. Want to be among the elite installers in the floorcovering industry? Join the thousands of floorcovering professionals in the U.S. and Canada who have become INSTALL certified. 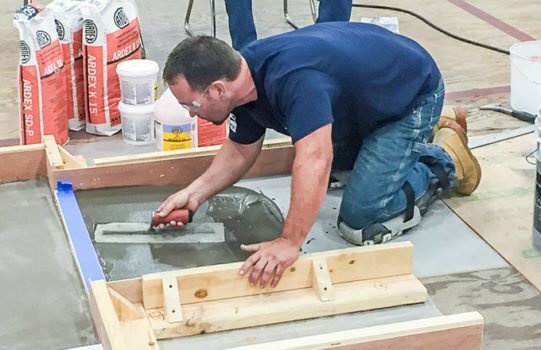 With INSTALL, you receive the very best training and preparation the industry has to offer. Industry veterans reinforce basic fundamentals and teach the latest trends, technology and techniques. After you have completed the training and successfully proven your skills, you’ll be uniquely prepared to perform even the most complex installations and increase your value to current or future employers. INSTALL trains flooring mechanics across the country, and awards floorcovering certifications in carpet, resilient, substrate prep and partners with the National Wood Flooring Association to offer certification opportunities in hardwood installation, sanding and finishing.